With more focus on having fun on the track and inviting the younger crowd to the track, Yamaha plans to make track focussed bikes in the smaller engine segment. With this philosophy, the Japanese brand unveiled the R3 GTYR at EICMA 2018. Based on the new Yamaha R3, this lightweight supersport takes an already capable bike to the next level. The R3 GYTR is aimed to give the rider the most engaging experience possible and also win at the track and looks very nice in Yamaha’s blue shade. Yamaha is working very hard for the 2019 race season and what place can be better than the EICMA to showcase their hard work. The GYTR gets some extra equipment which differentiates it from the normal R3, the suspension is tuned for the track and uses an Ohlins fork at the front end and an Ohlins monoshock at the rear. Talking about the front end, Yamaha offers a Brembo disc at the front end as standard. This racing machine is made to be thrashed on the track, so to keep it cool during the harsh treatment is a new Febur radiator. This high-performance radiator will make sure the rider does not have to compromise when things get hot. Helping the bike breathe better and also reducing the weight a bit is an all titanium exhaust supplied by Akrapovic. 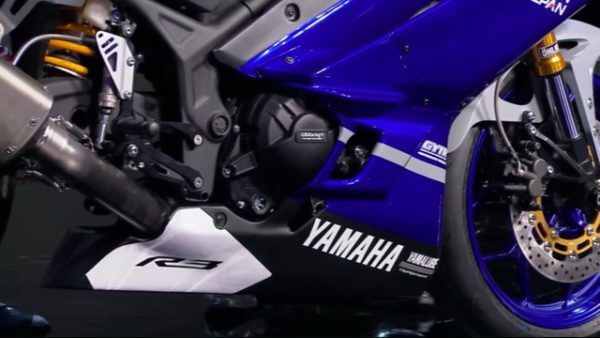 Yamaha also has plans to bring in a GYTR racing kit mod for the engine, which would be compliant to the FIM standards with the GYTR. Yamaha has been a star at this years EICMA with so many new products unveiled, it is exciting for us bike enthusiasts. The Japanese bike maker also unveiled a range of other bikes like the YZF-R1 GYTR, the Tenere, Niken GT and much more. Keep looking at this space for more updates on the lovely bikes unveiled at the EICMA this year.